More is known about the early history of the Warner family of the Town of Berne than is written in the history books, and much of what is written is wrong. This summer saw the publication by The Warner’s Lake Improvement Association of Life at the Lake: Warner’s Lake, N.Y . It begins by telling how brothers Christopher and Johannes Warner settled on the shores of Warner’s Lake in 1765 and built a gristmill in East Berne on land leased from Stephen Van Rensselaer. Our Heritage, the history of Berne published in 1977, agrees, except it does not say it was a gristmill. In fact, when the Warners moved to the Beaver Dam (now Berne) from Schoharie they settled between what are now the hamlets of Berne and East Berne. A sawmill rather than a gristmill was built on Fox Creek just upstream from the intersection of Turner Road with Helderberg Trail. It was operated by both the Warners and the Zehs according to 1787 Van Rensselaer records. The Warners and Zehs did not originally lease their land from the Van Rensselaers. Rather, they were squatters, as were all early Berne settlers, on a vast tract of land that had been granted by the Dutch to the Van Rensselaer family in 1629. The VR land in the Hudson Valley was leased long term, but never sold. About the time of the Revolutionary War the VR family became aware that squatters from Schoharie and elsewhere had made themselves at home in the wilderness above the Helderberg escarpment. The south part of lot 565, on the south side of Fox Creek, was the farm of “ Johannis Werner.” He also farmed the east part of lot 585 which was just west of Warners Lake. The accompanying illustration does not show the three lots his brother Christopher Warner had on the north side of the Lake. The 1787 survey map shows “ H. Werner” on lot 581 east part (upper left corner of illustration). Cockburn’s survey notes say "This land in lot 581 is very poor and lies chiefly on the north side of a very steep hill. It is well watered by the Foxenkill on the north side of which the land is middling good. Henry Warner has got a part of his improvement on it. Beech, maple some elm and fine timber." Just to the east is lot 582 of which the surveyor reported: “This is a good lot and is well watered by the Vosenkill [Foxenkill]. Henry Warner has got a framed house and barn and a fine improvement on this lot. Beech, maple and hemlock timber." A Van Rensselaer record dated Sept. 10, 1790 notes " Henry Warner's property leased. John H. Warner his son owns it." Henry Warner was the brother of Christopher and Johannes. His house is probably the “1795” house opposite the Helderberg Senior Center. Although a Berne Historical Society officer says it was built by a Zeh, the Van Rensselaer lease records and 1787 survey map indicate the house was built prior to 1787 by Henry Warner. Henry, Christopher, and Johannes were three of five sons of Mathias Warner Sr. who was born 1707 in Württemberg, Germany. Mathias’ father, Christopher Warner, was one of hundreds of refugee families from the Palatinate area of Germany brought over by the English in 1710. They were to be resettled in the wilderness on the frontier in upstate New York to serve as a buffer between the English settlements along the Hudson, and the French and Indians to the west and in Canada. But first, to pay back the cost of their transportation and subsistence, they were to endure years of forced labor in a work camp on the Hudson devoted to the production of tar for the British Navy. When this operation failed in 1712, Christopher Warner, along with the Zehs and more than a hundred other families, sought refuge in the Schoharie Valley. Long before 1790 all five of Mathias Warner’s sons were living in what is now the Town of Berne. His younger son, Philip, was 20-years old when he was confirmed at the Beaver Dam reformed church in 1767. Since he was single and undoubtedly living at home, it is likely that his father, Mathias Warner, moved his family to Beaver Dam by 1765 when the Warner and Zeh sawmill was established. The 1866 Beers map of Berne shows an “ F. & S. Mill” (Feed and Sawmill) in the same location. The mill buildings were likely used into the early 20 th-Century. Today, the remains of the millpond dam and wooden flume, as well as the foundations of the mill buildings, can still be seen at the site. On the eastern part of the sawmill lot was the Zeh and Warner families burying ground with the earliest known burial 1777. The Zehs and Warners were instrumental in the 1790 incorporation of the Lutheran Church in Beaver Dam. July 1797 the church leased lot 564 where the sawmill and burying ground were located. Using planks sawed at the mill, a frame church was constructed near the burying ground, now known as the Pine Grove Cemetery. During Berne Heritage Days 2002 a NYS Historical Marker was erected near the site of the early church. The 1787 survey map shows no buildings and no one living near what is now the hamlet of East Berne. 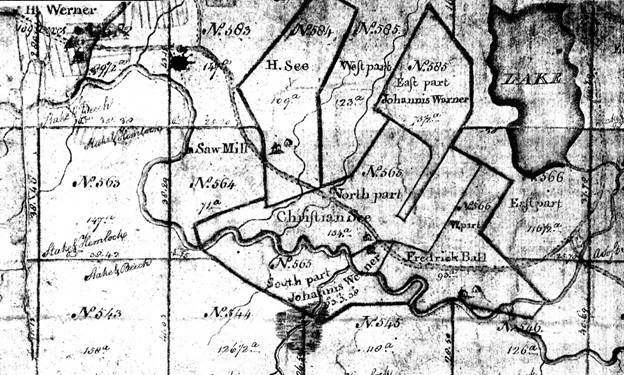 In 1791 Johannes Werner Sr. leased the 126 acre lot 546 where the hamlet is now located. Willis Warner, in his 1954 compilation of records on the “Descendents of Christopher Warner,” says it was on two acres of this lot that Johannes, in partnership with his brother Christopher, built a gristmill. His source is not clear. The hamlet that formed around the mill was called Warner’s mill until 1825 when the East Berne Post Office was established. In 1822 Johannes Warner’s lease on lot 546 was inherited by his son Johannes Jr. who in 1838 sold it to Lehman Lobdell. An 1854 map shows in the hamlet of East Berne a gristmill owned by Lobdell on the outlet for Warners Lake, and a sawmill on Fox Creek behind the current East Berne Fire House. Today a NYS Historical Marker, half-way between the two mills, supposedly identifies the location of the 1765 Warners’ mill. However, as Van Rensselaer lease records make clear, it was about 1791 the Warners established the sawmill in East Berne. This raises the question of who built the 1765 sawmill between Berne and East Berne. It may well have been Mathias Warner and Johannes Zeh, Jr., both of whom moved their families from Schoharie to Beaver Dam by 1765 and settled on the farms surrounding the mill site. A third Warner’s sawmill was built by Christopher Warner probably about 1800 on the small inlet stream at the north end of Warners Lake. Undoubtedly it was lumber cut at this mill that was used by Christopher Warner to construct his large framed house that is still lived in by his descendant Mary Warner Bassler. The erroneous histories of the early Warner family show the importance of using primary sources rather than relying on later secondary sources and family tradition.